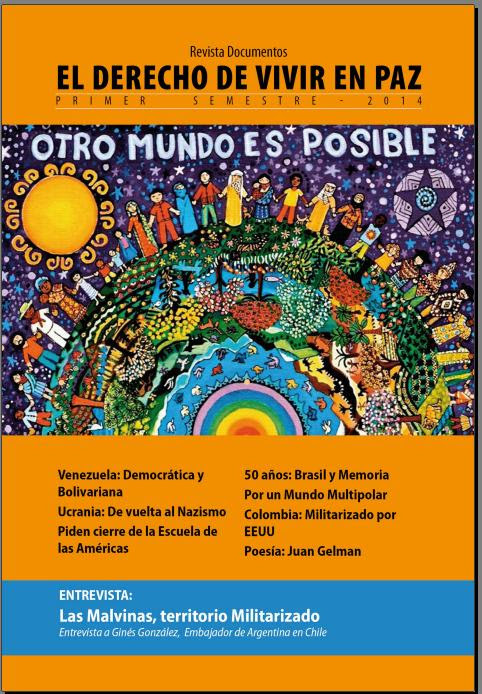 Ponemos en sus manos el tercer número de la revista El Derecho de Vivir en Paz que es iniciativa de SOAW en América Latina y que cuenta con el apoyo de organizaciones hermanas de nuestro continente. Hace pocos días atrás, nuestro fundador, el padre Roy Bourgeois, junto a María Luisa Rosal y Kevin Moran, realizaron una caminata de 120 millas, desde las puertas del Fuente Benning, donde está ubicada la Escuela de las Américas, hasta el Instituto de Tecnología de Georgia donde se fabrican y desarrollan los drones asesinos. Con esta caminata pusieron en alto el Derecho a la paz que tienen los pueblos y nuestra oposición a las políticas asesinas que sigue impulsando EEUU. En este número ponemos énfasis especialmente en la situación de Venezuela y llamamos a expresar nuestra solidaridad con este pueblo hermano que sufre fuertes intentos de vivir en un golpe de Estado. Los invitamos a leer y difundir este material entre sus contactos. Hoy, más que nunca, la lucha por la paz y el respeto a la autodeterminación de los pueblos, es fundamental. In 1990 SOA Watch began in a tiny apartment outside the main gate of Ft. Benning. While starting with a small group, SOA Watch quickly drew upon the knowledge and experience of many in the U.S. who had worked with the people of Latin America in the 1970's and 80's. Today, the SOA Watch movement is a large, diverse, grassroots movement rooted in solidarity with the people of Latin America. 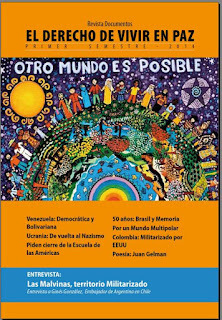 The goal of SOA Watch is to close the SOA and to change U.S. foreign policy in Latin America by educating the public, lobbying Congress and participating in creative, nonviolent resistance. The Pentagon has responded to the growing movement and Congress' near closure of the SOA with a PR campaign to give the SOA a new image. In an attempt to disassociate the school with its horrific past, the SOA was renamed the Western Hemisphere Institute for Security Cooperation in January of 2001. Read more about the history of the SOA Watch movement. The staff collective works out of Chile, the United States, and Venezuela. We currently also have two SOA Watch activantes on the ground in Honduras. The SOA Watch national office is located in Washington, DC. SOA Watch StructureRead more about SOA Watch structure and how you can get more involved. Go directly to the working groups page, or find a local SOA Watch group in your community. Read more about the SOA Watch Council, the national decision-making body of SOA Watch.